Well, welcome to summertime in Oklahoma! It’s been a warm one, to say the least, but thankfully we have had a lot of rain for those summer gardens that some of us are growing. With those summertime rains, and well a lot of watering on our own, comes a beautiful and bountiful harvest. This is almost sounding like a Hallmark Card… so I’ll get to it. So a lot of folks have been coming up to me….in grocery stores… asking what they can do with the tomatoes that are popping out right and left this year. First, congratulations… and I am a little bit jealous ( I didn’t plant a garden this year). Secondly, that is a great question! Although it’s nice to incorporate those tomatoes into salads ( yawn ) it is also a challenge finding new ways to use them in your everyday meals. My friend Allison Dake from Brown Egg Bakery (Fabulous wedding cakes, showers cakes, birthdays cakes, anniversary… you get it) came up with a recipe awhile back for Edible Oklahoma City Magazine that I have never been able to get out of my head. The recipe was for her “Tomato Burst Pie” and it looked and sounded amazing. When thinking of what one can do with homegrown tomatoes, this pie of hers was the first thing that came to mind. 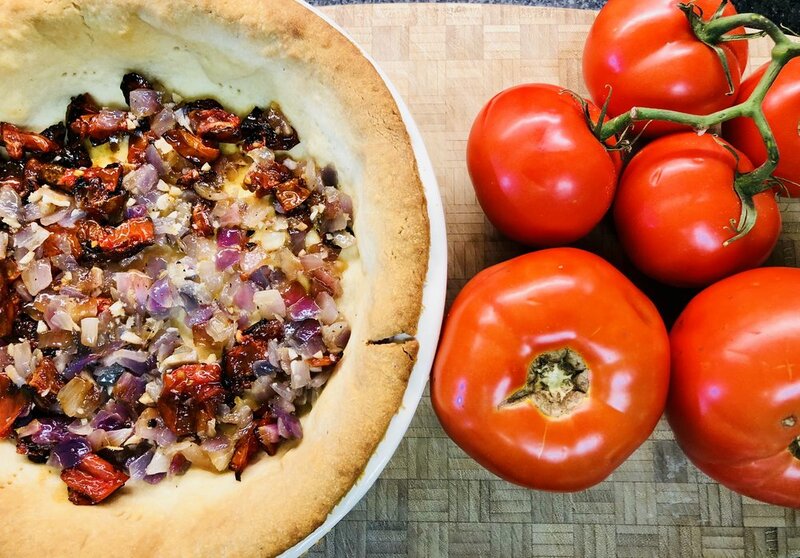 Off I went through my grocery store, a man on a mission, gathering ingredients left and right to come up with my own version of a Tomato Burst Pie… and you know what? Well, it turned out pretty dang good! Keep the stems attached for added appearance! The idea is to load that pre-baked pie shell full of as many and different kinds of tomatoes as I can. Anything from Heirloom to Beefsteak, Cherry tomatoes to Romas, and in all sizes and cuts that I can think of. Well, also loading it up with creamy “smokey” cheese added to the ultimate summer savory pie treat. The “burst” comes from baking in a hot oven and allowing any whole or large-half cut-tomatoes to char and burst while baking. Those juices pouring out, combined with the creamy and smoky base, really gives this pie a rich texture… to match that rich flavor. Check out the recipe and see for yourself. If you’re planning a gathering in your home or knocking out a brunch with friends, this Tomato Burst Pie is for you! Enjoy! In a food processor add your flour, Cook’s Line Seasoning (or kosher salt) and pulse a few times to blend and mix. Add the frozen cubed butter and vegetable shortening, and pulse the mixture until it resembles coarse meal. With the processor running add the ice water one tablespoon at a time until the dough comes together into a ball. Remove the dough to a lightly floured surface and form into a thick round disk, mindful to not over handle or over-work the dough. Wrap in plastic wrap and place into the refrigerator for 30 minutes or more while you work on the pie filling. When you’re ready to roll out the dough, form into your pie dish (I used a deep dish pie plate), and blind bake the crust, remove it from the fridge and back onto a floured surface. Roll the dough out to at least a 1/4” thickness. Preheat your oven to 425 degrees. Form the dough loosely into your pie plate. Trim of the excess overhang of the dough, trim and crimp the edges. Dock the inside of the dough with a fork, lay a sheet of parchment paper or foil on the inside, and fill the inside with pie weights or dried beans. Place the entire dish into the oven and bake 15 minutes. Remove the sheet with pie weights (carefully) and place the side back into the oven to gently brown the crust. When the crust is a light golden brown remove the pie shell to cool in the dish. 3 pounds tomatoes, all kinds, all colors, all sizes, whole, halved, and sliced! The sweet homegrown tomatoes along with the creamy and smokey cheese... perfect! Preheat your oven to 425 degrees. Rough chop the tomatoes enough for two cups. I used the larger Beef Steak and Roma tomatoes to do this. Toss with a little olive oil and pinch of Cook’s Line (salt and pepper will work). On a small sheet pan scatter the tossed chunks out, keeping them separated enough from each other so they are not crowded. Place the pan in the oven and roast the tomatoes until lightly charred and cooked… about 20 minutes. Remove from the oven to cool. In a sauté pan heat a little of the olive oil. Gently sweat the red onions along with the garlic and fresh chopped thyme until tender and fragrant. Season with Cook’s Line or your choice of seasoning. Remove from the heat and cool. When cooled combine this with the roasted tomatoes. In a mixing bowl combine the ricotta cheese and shredded smoked cheese. Mix to combine. Time to build the pie: In the bottom of your pre-baked pie crust gently press in the ricotta cheese mixture. Smooth out gently and spreading out evenly. Top the cheese mixture with the roasted tomato and red onion mixture, again smoothing out evenly for your second layer. For your remaining tomatoes: Slice some thick to layer on top of the roasted tomatoes.. it does not have to cover the entire pie. Slice some whole even with the stem exposed for appearance, and place on top of the pie. If you have brightly colored cherry tomatoes use these whole to fill in the gaps… just really fill it up and make the pie as decorative as you can. Add more tomatoes if need be. Because we will be “blasting” this pie in a hot oven and your crust has already been pre-baked, tear out a long sheet of aluminum foil to make a “collar” to fit around the exposed crimped crust so that it does not burn. Fold the foil into a collar, fit to around the edge of your crust, and gently crimp on to the edge of the pie plate. Place the pie into your upper oven rack and bake 20-25 minutes or until the tomatoes burst and lightly caramelize/char. Remove the Tomato Burst Pie from the oven, remove the collar. Serve the pie warm or even chilled. Garnish with fresh herbs, whole and chopped. Enjoy!